Not much has changed, sort of, since Greg Gardill last strapped on the Pirate gear that historic day in Atlanta, when East Carolina capped a dream of a season with the win over North Carolina State. When he comes home from his job, he’s wearing the grime of the turf, the sweat of another physical day in the trenches. And he is exhausted, yet exhilarated for again successfully prevailing over a bunch of heavier, bigger opponents across the line from him. 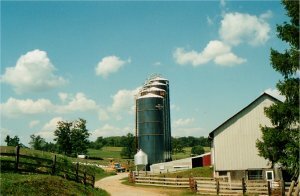 Today, however, Gardill is a cattleman and his foes aren’t really foes, they are his 300 head of corn-fed, pure Somerset County, Pa., cattle, which he raises to supply beef to businesses and consumers in Western Pennsylvania. Gardill with some of his co-workers. "Blue Collar," they call it, and Gardill, for one, is damn proud of it. From his prep playing days in Johnstown, Pa, to his college days in Greenville and back to his life at home in Johnstown, Gardill has been consistently low key, workman-like, and above all, successful. Moreover, he has been happy all the way. “I love it,” he said of his livelihood. “Every day I get up, it's something new. One day I’m a plumber fixing the water line, the next day I’m a mechanic repairing the harvester. Then I’m a veterinarian. You just never know what each day is going to bring... and I like that. The 15 to 20 hour days feel good to the former defensive end/tackle and he gets through each day much like he did as a player…he works hard. That attitude, along with a love for what he does, defined Gardill from a young age, growing up in one of the steel towns that line the route between the State Capital in Harrisburg to Pittsburgh in Western, Pennsylvania. It was always football, family, and farming that most interested Gardill. Gardill prepped at two different schools, first going to Bishop McCort – where he is an assistant coach today – and finishing high school at Johnstown High. At Johnstown, his coach, Jerry Davitch, would end up being more than just a coach, but also a cherished adviser — and the man who eventually helped Gardill find his way to ECU. With Prop 48 status hanging on the results of a grade in English his senior year, many of the schools that were recruiting him were backing off. Though the 6’2”, 235 pound offensive guard and defensive lineman was being recruited by the likes of Notre Dame, Penn State, West Virginia, Syracuse, and Pittsburgh, it was East Carolina that stuck with him to the bitter end – when he did get his “B” in English to fully qualify. And it was his coach, Davitch, who put things into perspective for Gardill, who lived by his mentor's mantra. He chose East Carolina and played in 44 of 45 games, finishing with four letters and spending three seasons as a starter, where he remained injury-free. 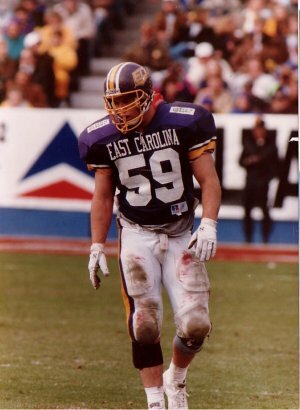 Gardill during his game days as an ECU Pirate. What made his career even sweeter were the moments where his past intersected with his future. For instance, as a freshman at ECU, he was in a class that included two players from Maryland, who were both on the Maryland roster for the “Big 33” game that pitted prepsters from Maryland against the top 33 from Pennsylvania. Gardill was left off the Pennsylvania roster, though he was among the nominees and was an all-state player. There were other moments, too. Throughout his career, he would be part of ECU teams that knocked off Syracuse, Pittsburgh, and West Virginia — all teams that backed off on Gardill. Had he gone another direction, Gardill acknowledges that his football career would not have been as dramatic. 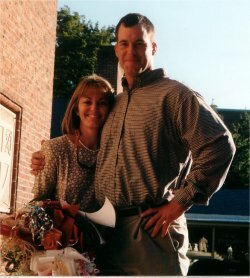 Gardill said he sensed that becoming a reality with the team just before the South Carolina game in 1991. And at the end, after the Peach Bowl, Gardill clearly remembers his thoughts. Today, it manifests itself in many ways. His fishing buddies call him “Peach Bowl” and his two-month old baby girl bears the initials E.C., for Elizabeth Caroline. His wife, D.A., whom he met while at ECU, in his words, “bleeds purple and gold,” and is as a big a Pirate fan as you’ll find. The only difference these days is that instead of roaming the turf at Dowdy-Ficklen, Gardill roams the sod of his 500-acre farm, working the land with his father Rob, the gentleman farmer. During the week, Gardill finishes his day coaching football at Bishop McCort, where he is able to rekindle, though not recapture, the camaraderie he greatly misses from his days as a Pirate player. He shares his lessons learned from his playing days with his players. Today, his 12-hour days are just that, a rare combination of self-satisfaction, fun, and hard work. 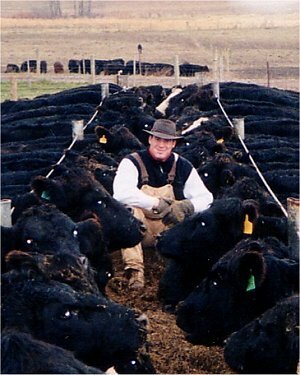 For something that started out as a hobby for his dad, older brother Bobby, and himself, the cattle business has been good to him and his family. And, true to form, his proudest moments are when he takes a chance to reflect on the work he is doing and the family he has. “I joke with D.A. sometimes,” he said. “I’ll call up to the house and ask her what she is doing and she’ll say, ‘I’m feeding the baby,’ and I’ll say, ‘I’m feeding the cows,’ and we’ll laugh about that being all we're ever doing, feeding the girls. (D.A.) is doing a great job of being a mother and I’m just there trying to give her a lot of support. We’ve got our dog, Jake… the baby… yeah, things are going pretty good. “It had to be running to the Student Store naked. I guess it had been a tradition that sort of broke off for about three years, but five of us were bored and had to do something. We decided to bring back the tradition, but we decided to take our helmets along and headed down to the Student Store naked. When we got to that little crick down at the foot of the hill, someone saw a cop, so we all jumped into the stream. I remember Shane Hubble started to talk about that movie, “Stand By Me” and said something about the scene in that movie with the leaches and then said, ‘This is what makes friends forever.’ When we got to the Student Store, we took a picture, like a team picture, with one hand over the privates and the other holding our helmets up in the air. There are still some copies of that picture somewhere out there. I remember it pretty well because when we were in the stream, I was the only one of the five that got Poison Ivy. Editor’s Note: Based on purported pictorial evidence, the Naked Five were identified as Gardill, Ken Burnette, Shane Hubble, Chad Grier and Sean McConnell.